Typical JR ticket is like this. I have received many inquiries about Tokyo-Osaka one way trip. I always recommend to use single ticket for long distance transfer. like from Tokyo to Kyoto, Tokyo to Osaka or Osaka to Nagoya. Because it is cheaper than Japan Rail Pass 7 days pass. I wrote the post about fare calculation before. But I think this post was not enough to explain the fare rule. JR single ticket rule is very complicated for the tourists from oversea. But you don’t need to understand everything. If you understand some basic rules, single ticket is more useful and it may save your cost. In this post, I show you some basic rules of single ticket for long distance transfer and how to use and purchase it. Simply you can purchase it at the station. In major stations, you can purchase it at even vending machine. Especially when you purchase a ticket for short distance transfer, vending machine is the easiest. But ticket window is easier to purchase a llong distance ticket for the travellers. If you want to take express trains, you have to purchase express surcharge ticket too. Even if you want to take non reserved seat on limited express, you have to purchase it. Both reserved and non reserved ticket for limited express (Shinkansen as well) can be purchased at “Midori no Madoguchi”. Midori no Madoguchi is the name of JR reservation window. You can purchase base fare ticket at Midori no Madoguchi too. Please get the detail about reservation at the post, “How to reserve the train seat of Japan Railway. Is Online reservation available for Japan Rail Pass user?“. In the case of purchasing both base fare ticket and limited express surcharge ticket, you can purchase it in advance. The express surcharge ticket is on sale one month prior to departure date. You can purchase the tickets after Nov 1. You also can purchase the tickets at any JR stations if you buy both base fare and limited express surcharge at same time. For example, if you start to travel from Tokyo station, you can purchase it at Narita airport station on the day of arrival. Base fare ticket can be purchased at any JR stations where station staff is on duty. There are many station without station staffs in remote area. In major cities and major stations, there are station staff. Even if you take a train at the station without station staff, you can purchase it from the conductor in the train. You can use Hyperdia to get the fare quite easily. *The above image was captured in 2013. The fare was raised in April l, 2014 because of consumer tax was increased to 8% from 5%. The actual fare is different from the fare in the image above. The price of Japan Rail Pass 7 days ordinary is 28300 yen. (New price is 29110 yen.) Total single fare is more than 10000 yen cheaper than 7 days pass price. This is the reason why I recommend to use single fare for Tokyo – Osaka one way transfer. Please see the above capture image of Hyperdia again. You also can find a distance at Hyperdia. This is a key to use single ticket. Actually long distance ticket can be used in multiple days. From 1001 km and up, add 1 day every 200 km. If you travel more than 101 km but it is in Tokyo or Osaka zone only, ticket valid in one day only. So in above capture image, distance is 613.4km. This ticket valid in 5 days. You can stopover as many as you want. Of course you cannot go back. Once you start to travel, you have to go forward. You have to care only one thing. When you depart/arrive to travel at the following areas, you cannot stopover in same areas. These areas are same as city limit. I show you some examples. You can NOT – Stopover at anywhere in Tokyo 23 wards. For example, after you start to travel from Tokyo, you cannot stopover at Shinagawa. You can – Stopover at Kyoto, Osaka and anywhere outside of Tokyo 23 wards. By the way, you can start to travel from anywhere in Tokyo 23 wards. You can NOT – Stopover at anywhere in Osaka city. For example, you cannot stopover at Shin-Osaka. Once you exit at any stations in Osaka city, your ticket will be expired right away. You can – Stopover at Tokyo, Kyoto, Nagoya and anywhere outside of Osaka city. By the way, when you travel through Tokyo downtown core, ticket will be calculated by the shortest route. For example, most typical route from Narita to Osaka via Tokyo, via Tokyo station and Shinagawa station. But if you want to go to Osaka via Akihabara and Shinjuku, you can take this route and stopover. But in case of using limited express, you have to purchase limited express surcharge ticket for each segments. ex) Tokyo – Osaka trip, stopover at Nagoya. You have to purchase two Shinkansen tickets, Tokyo – Nagoya Shinkansen surcharge ticket and Ngoya – Shin-Osaka surcharge ticket. Please see above capture image of Hyperdia again. If you use this ticket, you can do the following itinerary. When you arrive in Tokyo, you can use other deals, such as Suica & N’ex. And you have 5 days after you finish to see Tokyo. If you add Suica & N’ex one way ticket, total amount is 19620 yen. It is about 9000 yen cheaper than JR Pass 7 days. I believe this is the perfect solution for Tokyo – Osaka one way travellers. I planning a trip from mikawashima to katsuta (transtit in kashiwa)… i already check hyperdia..it show the fare around ¥2940 for the entire trip. If I already bought the ticket for limited express tokiwa can i use the ticket from mikawashima station to Kashiwa station? Or i keep pay using suica for both station? If you meant that you have a limited express seat ticket only, you can use it and you have to pay base fare only which is 1940 yen. You can use Suica for this 1940 yen portion. If i already have jr east pass and planning using shinkansen kodama from mikawashima via tokyo to Atami station…which fare should i paid for this trip? Is there any other pass i can use for shinkansen kodama? You have to pay full fare for Tokyo to Atami. Shinkansen is not covered at all. Even base fare is not covered. There is no deals either. You have to pay around 3,500 yen. how should I buy the sinkansen ticket or any other train to get there..? If you want to use a regular ticket, you can purchase it at any major JR stations. In downtown Osaka, most of JR station have a ticket window. You can use Tokyo Wide Pass for Gala Yuzawa and Lake Kawaguchi. If you visit these places on day 8 and 9, you can use Tokyo Wide Pass to take Narita Express to Narita. You can use Tokyo Wide Pass for sightseeing in Tokyo. But if you use it for access to Narita, it’s more cost efficient. If you don’t use Tokyo Wide Pass for sightseeing in Tokyo, you can use Tokyo Subway Ticket for sightseeing in Tokyo. Hi Takeshi…Thank you for your information. Now I understand that better I buy one trip sinkansen from Osaka to Tokyo, is valid for 5 days or 4 days..? 11 Nov to Shirakawa Village (Just Visit Back to Nagoya), can we go to Mitsui after shirakawa village..and how to get there? (not sure how long to go to shirakawa from Nagoya). 12 Nov to Tokyo..can we go to Kawaguchi lake using same sinkasen osaka-tokyo without paying more..? we just visit Kawaguchi and stay at Tokyo. 12-16 Nov at Tokyo, but 13 Nov to Gala Yukawa and 15 Nov to Hitachi Sea side and back to tokyo..I know I can used JR Tokyo Pass to go to Gala Yukawa, but can I used it to Hitachi sea side..? should I buy JR Tokyo Pass or what should I use to go to all the places around tokyo..? You can use one way ticket for Osaka to Tokyo via Nagoya. But you must have two separated Shinkansen ticket for Osaka to Nagoya, Nagoya to Tokyo. Only base fare ticket is allowed to use for Osaka to Tokyo. Shinkansen ticket is required for each rides. I don’t recommend you to add any more places after trip to Shirakawago. Please see the link below to find more info about access to Takayama and then go to Shirakawago. You can use Tokyo Wide Pass to get Gala Yuzawa and Katsuta (gate station to Hitachi seaside park). You can use Tokyo Wide Pass to take a local train in downtown Tokyo too. 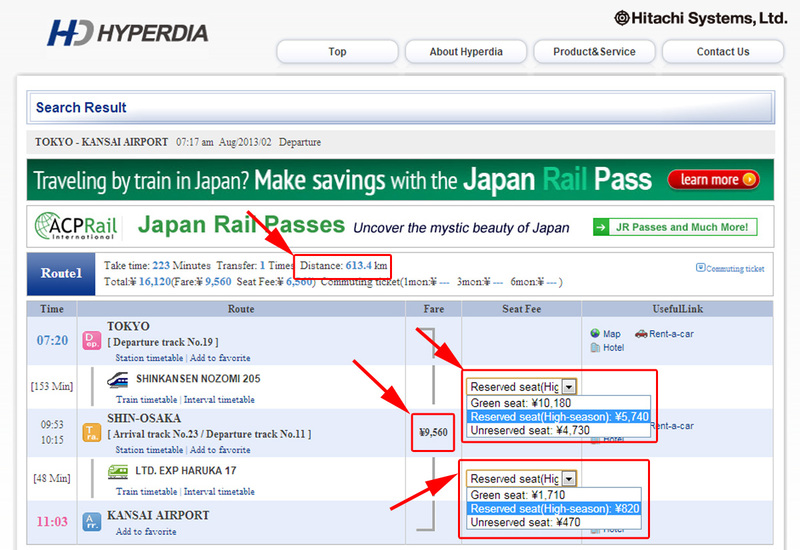 When I buy ticket sinkansen from Osaka to Mishima via Nagoya..how long the ticket valid..? and can I pass in nagoya for 2 days and go again to Mishima…all in `1 ticket fare Osaka-Mishima..? You can use same ticket. Please find the distance in hyperdia and see the table in the post above. You can find how many days you can use it. where can I buy JR tokyo wide pass? Your info and responses here are invaluable. Thanks so much! Quick question: We’re taking shinkansen 18 November Tokyo – Karuizawa, then 24 November Kanazawa – Tokyo. JR Pass is not cost-effective, so we’re buying individual tickets once we land in Tokyo. Are reserved seats required for this trip? Or just suggested? Reserved seat is not required but recommended. Hi! Should I buy the 7-Day JR pass or a single trip ticket for my itinerary below? I think base fare (one way) ticket works for me but any idea if I can slot Nara in between, please? You can use one base fare ticket from Tokyo to Osaka via Kyoto and Nara. But actually if you buy a base fare ticket one by one, Tokyo to Kyoto, Kyoto to Nara, and Nara to Osaka, it’s not much different from using one base fare ticket. And also if you go to Nara, you can catch Kintetsu Railway from Kyoto. Kintetsu Railway Nara station is better location than JR Nara station. If you take Kintetsu railway, it’s different from JR. You have to pay separately anyway. And in this case, total cost is not much different either. I just found out about the ICOCA card which seem to go on any train even in tokyo, and we could top up as we go. This might be what we need! Im trying to understand how we can use this for shinkansen to odawara & tokyo. Would be great if you have any advise on this card. Thank you! This is really useful for our family trip. I’m so glad I chanced upon your site. We’ll be travelling from Osaka to Tokyo, stopping Odawara. Now from this explanation, I know that we can get 1-way ticket and stop at Odawara for 2 days. For reservations, can we make 2 reservations? Osaka-Odawara & Odawara-Tokyo 2 days later? You will need three tickets, base fare ticket from Osaka to Tokyo, Shinkansen seat ticket from Shin-Osaka to Odawara, and Shinkansen ticket from Odawara to Tokyo. You have to make two different reservation, Shin-Osaka to Odawara and Odawara to Tokyo. You can make these at same time. You don’t need to do it at Odawara. You can make those before you leave Osaka. Now for the cities, I’m trying to figure out what passes will we need in Osaka and Tokyo as I realise that the JR lines don’t go to everywhere we need to go. I figured might need a few passes eg if we’re transfer from a local line to a JR line? can we get one way tickets on different rails from the first departing station? Same thing in Tokyo. Say I take the JR one-way to tokyo but it ends at Tokyo station; then we need another pass for other lines? If you use JR trains only, you can use one base fare ticket. In this case, you can use one base fare ticket from Osaka to Odawara. You cannot use same ticket from Odawara to Hakone-Yumoto because it’s not JR.
You can use one base fare ticket. You cannot use same ticket from Tokyo to Asakusa because it’s subway, not JR.
Me and my friend will travel to Japan this early November and wondered whether or not to buy the 7day JR Pass, until I saw this post. I need your suggestion on our itinerary for the best transports within the city/area. Judging from what you say, I should buy a single ticket from Tokyo to Kansai on day 4 so I can use it for stop over in Kyoto, but my pass will expire on D8. Will this be still a good option? Is it safe to buy from the counter or I do need to buy in advance? And I read somewhere that the stopover only eligible if it is not a reserve seat ticket, is this true? Also, may I know where can I find the information of the single ticket validity online? JR pass 7 days is your choice because you will go to Nikko and Miyajima. You can use 7 days pass for day day 3 to 9. Do not use single ticket for these trips. We changed our itinerary a little bit, basically, we gonna skip Miyajima and go to Minoo park instead. Do you think we still need the 7days JR pass or we should buy the single trip shinkansen to Kansai? JR pass is still recommended. Round tip fare by Shinknsen and Local train to Nikko, and one way trip from Tokyo to Osaka by Shinkansen will be around 26,000 yen. And you can take Shinkansen to Himeji, local train in Kyoto, Osaka. It will be more than 30,000 yen. Minoo is not covered by JR pass. You have to take Hankyu Railway. If you go to Miyajima, it’s covered and your saving is much bigger. My family of 5 will be staying in Osaka for 3 days, then to Okinawa, then back to Osaka for another 3 days. I am thinking of purchasing JR Kansai Area Pass for 2 days (1-2/9), with the use of Amazing Osaka pass as we are staying in AirBnB near Airport, nearest station is Hineno Station. Then to purchase a 1 day JR pass(6/9) because we are going to Kobe, directly from KIX airport, and 1 day JR pass(8/9), because we are going to Nara area/park, then to Dontombori area… Please advise me, whether should I just get single trip tickets for my stay there, or to simply get the pass. This is our 1st family trip there to Osaka, and this JR railway system is so stressful to me…..
For Sep 1-2, you can use Kansai area pass + Osaka amazing pass. For Sep 6 and 8, you can use Kansai thru pass 2 days. You don’t need to use it in consecutive days, so you can use it for Sep 6 and 8. You can take Nankai railway and Kintetsu railway to get Nara, Nankai railway and Hanshin railway to get Kobe. It covers subway in Osaka, so you can visit Dotombori or other spot after visiting Nara and Kobe. And also Kintetsu railway Nara station is better location than JR Nara station. If you use Kansai area pass, you have to take JR train. I am planning a round trip day trip from Narita Station to Chōshi. HyperDia calculates a fare of Y1140. Is this a round trip fare or do I need to buy a separate ticket back from Chōshi for a total of Y2280? Ps. The JR website leaves a lot to be desired. I have used belgianrail.be and bahn.com in Europe to build routes and get fares for travel within Belgium, Germany, France (French SNCF website is terrible) and Holland. It will give you a fare that includes all extra fees (if applicable) and all restrictions. These websites have many languages to choose from, and are user friendly. I wish JR could follow their example. It’s one way fare. You have to pay double. I hope JR group make more useful and user friendly website and online reservation system too.